Cubapetroleo's estimates are based on comparisons to known oil reserves found within similar geological structures off the coasts of the US and Mexico. The company said Cuba had undersea geology "very similar" to that surrounding Mexico's giant Cantarell and Poza Rica oil fields in the Bay of Campeche. Cuba's share of the Gulf of Mexico was established in 1977, when it signed treaties with the US and Mexico. The US Geological Survey (USGS) recently estimated that as much as 9bn barrels of oil and 21 trillion cubic feet of natural gas could lie within that zone, in the North Cuba Basin. 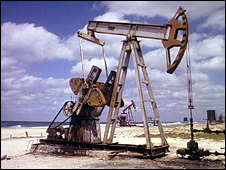 However, Cubapetroleo exploration manager Rafael Tenreyro Perez said his company's estimate was higher because it had better information about Cuba's offshore geology. "I'm almost certain that if [USGS officials] ask for all the data we have, their estimate is going to grow considerably," he told a news conference in the capital, Havana. If correct, Cuba's oil reserves would be almost the same as those of the US - 21bn barrels, according to the Oil & Gas Journal - and nearly twice the size of Mexico's - 11.7bn barrels. It could generate unprecedented wealth for the Communist-run state. But it would be difficult and expensive to extract the oil which is deep under the ocean floor. Mr Tenreyro said he expected the first production well to be drilled before the middle of next year by a consortium led by the Spanish oil company, Repsol, and that more wells could be started before 2010. Cuba currently produces 60,000 barrels of oil a day. It depends on Venezuela for an additional 93,000 barrels a day, which it receives at preferential rates in exchange for the services of thousands of Cuban doctors working in Venezuela.